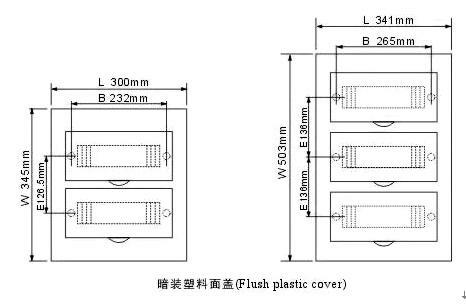 TSM series Flush type and Surface distribution boxes/distribution boards are mainly used in the circuit of AC 50Hz, rated voltage 220V/380V, and acted to install the modular combination equipment. It is widely used in the family, high building, house, station, port, airport, commercial house, hospital, cinema, enterprises and so on occassions. The plastic unit of the TSM Series Flush type and Surface type distribution boxes adopts ABS flame-proof material with the characteristics of flame-proof, impulse proof, excellent insulation property and so on. This Series Flush Type and Surface Type Suitable for indoor use, meanwhile, the plastic-sprayed surface has a stylish appearance. Products are available for the installation of terminal substitution rail, button box, small terminal, sigal, relay and sensor, communication and joint box etc.